Grand National 2015: Could Shutthefrontdoor start the shortest priced favourite of the modern era? Betfred, the official betting partner of the Crabbie’s Grand National, quote Shutthefrontdoor at 8-1 to be sent off the shortest priced favourite of the modern era when he lines up at Aintree on Saturday week. The eight-year-old, who heads the Grand National betting at 7-1 and is the likely mount of AP McCoy, will enter the record books if he goes off at 10-3 or less which will eclipse the price of Red Rum who started at 7-2 in 1975. McCoy has yet to confirm who he will ride in the world’s greatest steeplechase but is now as short as 1-20 with the same firm to ride Shutthefrontdoor – the 2014 Boylesports Irish Grand National winner – in preference to Cause Of Causes. “Shutthefrontdoor has been backed off the boards for over a month and the gamble shows no signs of slowing,” Betfred spokesman Andrew Griffiths said. “The McCoy factor is driving the odds down all the time so it would be folly to rule out a starting price of less than 7-2,” he said of the favourite who is set to carry 11st 2lbs in the four miles, three and a half furlongs contest. Meanwhile, a stone further down the weights, connections of Baileys Concerto (10st 2lbs) are hoping that the winner of five races this season, which includes a victory at Aintree in October, will secure a start in the big race. The nine-year-old, who schooled over the Grand National fences at Malton on Tuesday, sits just outside the top 40 entries and is one of six horses on 10st 2lbs. The British Horseracing Authority’s Head of Handicapping, Phil Smith, will reassess the horses that have been allotted the same weight after the five-day confirmation stage on Monday, April 6, to provide an order of elimination. “We are hoping that Baileys Concerto can make it into the final field for the Crabbie’s Grand National but, if he doesn’t get in, then we will give the Crabbie’s Topham Chase (Aintree, Friday, April 10) a go instead,” Cumbrian trainer Dianne Sayer revealed. “Brian Hughes schooled him over the National-style fences at Malton this morning. I think we caught the worst weather of the winter – we had wind, hail and rain – but the schooling itself went well. It’s another step on the road towards the Grand National and we are very happy with him. “He had a bit of heat and swelling in his leg when he came back from the Sky Bet Chase at Doncaster, which I was initially very concerned about but it was just him over-reacting as usual. “We lost a bit of time because of that and there was a suspicion when we ran him at Kelso that he wasn’t quite right but it would have meant a long break between Doncaster and Aintree. I wasn’t overly disappointed with that run and it will have hopefully helped us with regard to the Grand National. “The distance will be a step into the unknown and I really don’t know whether he will stay or not. He is probably in the best form of his life and, if we didn’t give it a go this year, then it could be that his opportunity might be missed. “If he was a more straightforward horse, then we would have made a plan to run in the Topham this year and then come back for the National next season but you have to take what you have got with him. Shutthefrontdoor finishing position – Betfred bet: 7 First, 8 Second, 10 Third, Fourth, 4/9 Unplaced. Shutthefrontdoor SP – Betfred bet: 6/5 – 5/1 to 6/1 inclusive; 5/2 – 7/2 to 9/2 inclusive; 11/4 – 13/2 or longer; 8 – 10/3 or shorter. 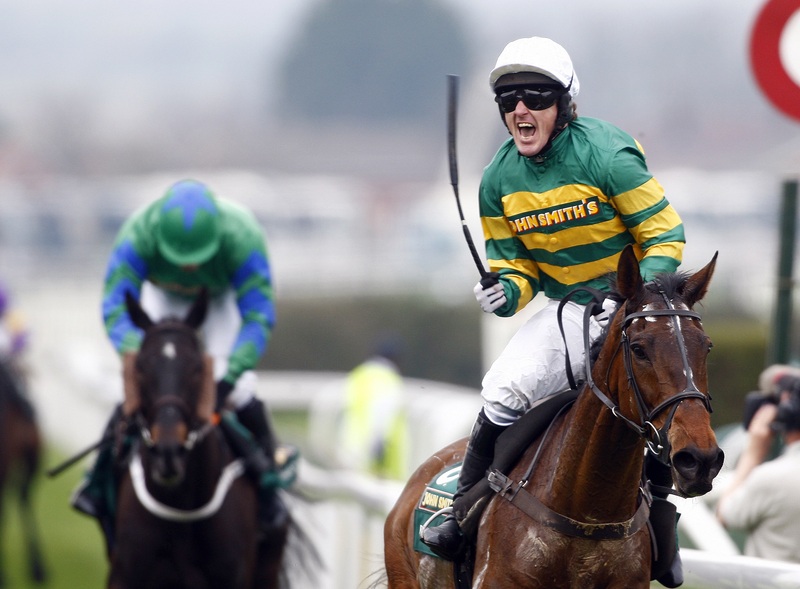 Who will AP McCoy ride – Betfred bet: 1/20 Shutthefrontdoor, 8 Cause Of Causes. Cause Of Causes v Shutthefrontdoor – Betfred bet: 1/4 Shutthefrontdoor, 11/4 Cause Of Causes. Shutthefrontdoor to win by further than Don’t Push It (5 lengths) – Betfred bet: 14 Yes.